CONTEST: Recreate our LOGO for your chance to WIN!! 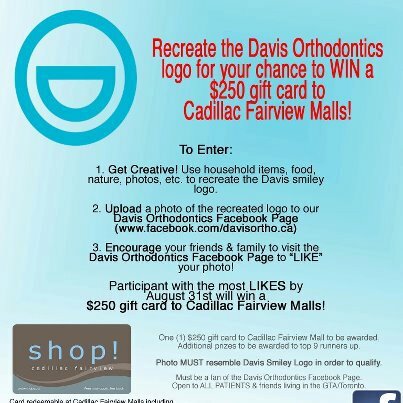 CONTEST NEWS: Get creative and recreate the Davis Orthodontics logo for your chance to WIN a $250 gift card to Cadillac Fairview Malls! Upload a photo of the recreated logo to our facebook page and the photo with the most LIKES Wins! Contest closes August 31st. See attached for complete details and look below for example!